It’s totally excellent when a simple concept results in something inspiring and fun. [Rich Decibel]’s Kequencer is a good example, starting off as many projects do: “I had an idea the other day and I couldn’t decide if it was good or not so I just built it to find out.” Be still our hackable hearts! [Rich] built this sleek little sequencer from scratch and while the design may not seem very novel to begin with–eight square wave oscillators with on/off switches and pitch knobs, played in sequence–but the beauty of it is in the nuances of interaction and the potential for further hacking. From watching the video you can see how the controls can be used in very interesting ways to create and mutate adorable chippy tone patterns. Check it out after the crossfade. Having been based off of [Nicolas Collins]’ work (as are all the projects on [Rich]’s blog so far) this instrument is ripe for hacking: the circuits are simple and easy to modify, so the addition of more complex (or just more) modules is a cinch. There’s always the Korg Monotron schematics to give you some ideas. Maybe incorporate some digital synthesis into the mix. 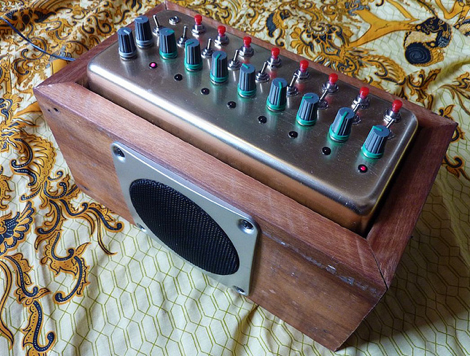 Or get crazy and include some noise generators and envelopes into the design for some percussive synth possibilities. Step aside, Roland! I honestly need a new pair of pants. Awesome. Fun. Love the wood box too! I would have put the scan speed knob up top, in line with the sequence LEDs. Seems more intuitive that way. Even though it is another frequency, it serves a different purpose from the other eight knobs. This is one of those hacks which is mesmerising for some intangible reason. Love it. Awesome hack, just pure brilliance. …sounds like a lost Owl City album! wow that is incredible. huge potential for fun and creativity! When he was setting the values, I though oh great another person messing about with signals and calling it “music”, then he started running. Boy was i wrong. This is lovely! Yeah, needs a headphone jack.